Why we need to Remove DRM from videos? Any benefit you can get from a DRM removal tool? As we all know, most videos purchased from iTunes Store are DRM-protected, which restricted you to watch your favorite video clips to certain devices. When you purchase or rent an iTunes movie, you can just watch it in iTunes Media Player or Apple's player such as iPod, iPhone or Apple TV. Can you imagine sticking to one video online service, one kind of media player and even one kind of video player? It is so discommodious. it is necessary to use a DRM Removal software, which can unlock iTunes DRM restrictions on Movies, TV show and music video purchased and downloaded from iTunes Store. When you remove the DRM protection from videos, the video files are free on any device, and you can save the movies from useless. 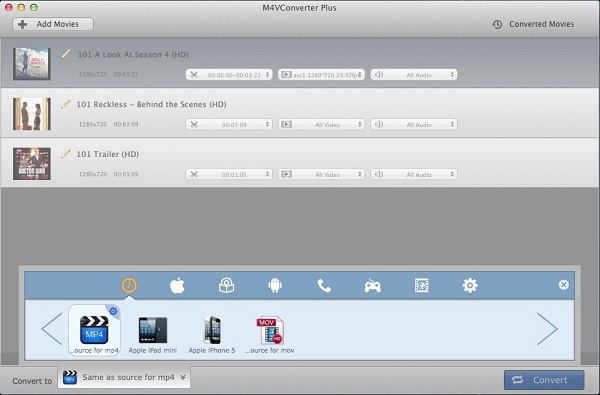 Why choose M4V Converter Plus? 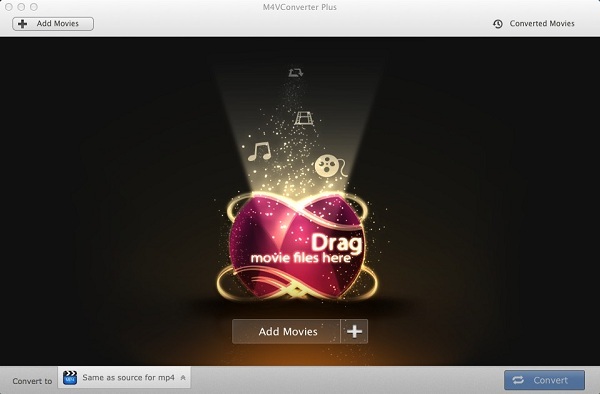 M4V Converter Plus is a powerful DRM clear Converter. It not only remove DRM protection from iTunes movies or TV shows, but also convert any videos that can be played on iTunes to common video formats. Besides, it can also support extracting audio from M4V files and save as MP3, AAC, etc. As a professional DRM removal tool, M4V converter Plus is able to convert protected M4V to unprotected MOV, M4V, MP4 etc. for the common devices. It is not only a M4V converter but also a best iPhone converter usually, which convert all protected video clips from iTunes library, the converted files can be playable on iPhone well. DRM, which is most commonly found in movies and music files, doesn't mean just basic copy-protection of video, audio and ebooks, but it basically means full protection for digital content, ranging from delivery to end user's ways to use the content. We can remove the DRM from video and audio files legally by quick recording. Typically, authorized recipients or users must acquire a license in order to consume the protected material: files, music, movies, according to the rights or business rules set by the content owner. DRM plays a very important role in the battle of cracking down on pirated compact discs and contents, however, To some extent, it also hurts the consumers' legitimate rights and takes much inconvenience to user. You can remove the DRM protection from iTunes videos by converting protected files to unprotected video or audio formats. You can convert M4V to MP4, MOV, AVI, FLV and other videos. You can also extract audio from DRM-ed videos and save as MP3, AAC, FLAC audio files. Besides, you can also select popular mobile players as output formats according to the devices you own. To learn more step-by-step to remove DRM protection from iTunes videos, please see the following detailed tutorial. Step 1. Free download the DRM removal tool on your Mac, install and launch it. It is a free trial version, which can only support converting one minute for a file. You can click the order link to get the full version. Step 2. Import iTunes protected videos to the program from the iTunes library. This program can support converting any protected iTunes videos, including iTunes purchased movies, rentals, TV shows and music videos. It can also support batch conversion. You can add several files to convert at the same time. Step 3. Choose the proper output format from the profile drop-down list. Step 4. Click Convert button to start the conversion. 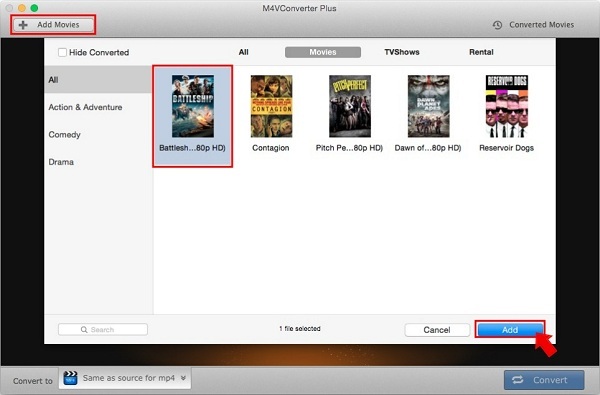 Few minutes later, you will get the converted iTunes files easily.